Air rotating around a large low-pressure system defines a cyclone. Extratropical cyclones create much of the unsettled weather in the middle latitudes of the Earth, while tropical cyclones fueled by warm ocean water represent some of the most violent of all storms. In common usage, “cyclone” refers to a tropical cyclone from a particular part of the world; the same storms, which have winds of 74 miles per hour or greater, are called “hurricanes” and “typhoons” elsewhere. 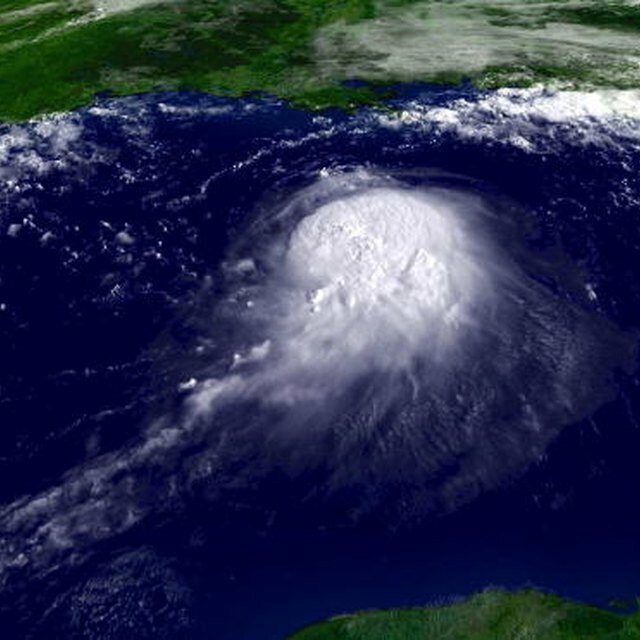 Tropical cyclones occur every year in multiple ocean basins, receive official names and tend to make the news – so they’re excellent starting points for teaching children basic weather facts. Tropical cyclones require ocean temperatures of about 80 degrees Fahrenheit or more to form, so they arise in a fairly narrow belt on either side of the equator: mainly between 5 and 30 degrees of latitude. In the South Pacific and Indian oceans, meteorologists simply call tropical cyclones “cyclones.” These violently rotating windstorms go by “hurricane” in the Atlantic Ocean, Caribbean Sea and Northeast Pacific; they’re known as “typhoons” in the Northwest Pacific. These different names all refer to the same kind of storm. A cyclone’s wind speed determines its intensity. Different parts of the world use their own intensity scales to rank tropical cyclones. In Australia – one of the regions where the term “cyclone” refers to these storms – a Category 1 cyclone has wind gusts of less than 78 miles per hour. In a Category 2 storm, gusts are between 78 and 102 miles per hour; in a Category 3, between 103 and 139 miles per hour; and in a Category 4, between 140 and 173 miles per hour. The most intense cyclones, exhibiting gusts of 174 miles per hour or more, fall in the Category 5 classification. When meteorologists see that a new tropical cyclone has formed, they give it a name in order to issue forecasts and warnings to people who may be affected by the storm. The World Meteorological Organization (WMO) oversees naming conventions for the different tropical-cyclone basins, with names for each new cyclone season applied alphabetically. Names can be reused across seasons, but those of certain cyclones that result in major loss of life or damage may be retired. National Oceanic and Atmospheric Administration: What is the Difference Between a Hurricane, a Cyclone, and a Typhoon? Copeland, Catherine. "Cyclone Facts for Kids." Sciencing, https://sciencing.com/cyclone-kids-8623017.html. 23 April 2018.